Sometimes it's fun to come up with a 100% all original idea. 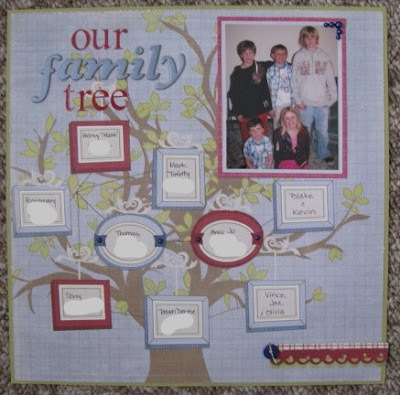 I did that on this "our family tree" layout. This layout uses a sheet of paper from the Fancy Pants' "My Family" line. When I first picked up this sheet, I had big plans of finding some heritage photos and doing something grand. Then I came across this photo that needed to be scrapped, so instead of planning/editing/cropping photos for the frames, I used them for names to make a family tree starting with my husband's parents and going down to their grandchildren (who are all in the photo). Sometimes it's fun to take layouts you see online or in magazines and adapt them to fit your own photos and supplies. I've been doing a lot of that lately. 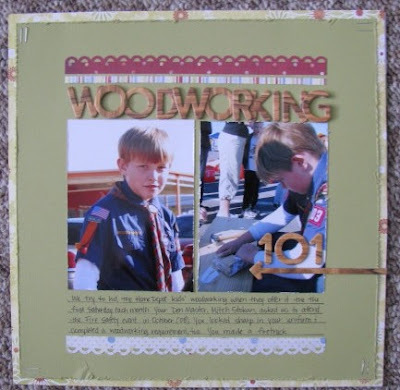 "Woodworking 101" was inspired by a Nicole Harper layout in the February issue of Scrapbook Trends magazine. Although her base was all kraft paper (layered), I opted to use the one sheet in the "My Family" line that I didn't like (a floral) for my base. My title letters (new Cosmo Cricket faux wood) were too long to stretch across the space above my photos, so I stacked them to make them fit in the space. I also used my handy dandy Making Memories edge distresser on my green cardstock AND on my photos. The photos are from a Cub Scout event at Home Depot in October '08. "2nd Place" is another lifted layout. 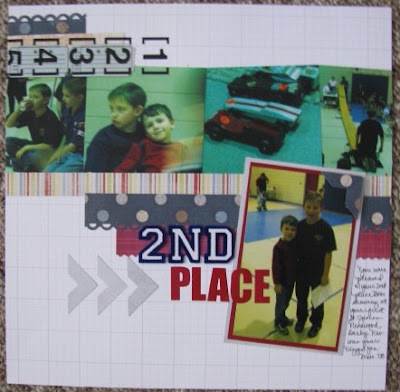 Again, my inspiration came from the February Scrapbook Trends, but the original layout was an 8.5x11 layout by Rhonda Palazzari. I added a 4x6 photo and changed the title placement. For last minute additions, I added a photo corner with pop dots and three more photo corners acting as arrows to accent the title. These shots were from the Pinewood Derby in March '08. My "cake bake" layout was also inspired by the February Scrapbook Trends - a layout by Pamella Brown. I pulled out some Scenic Route ruled paper for this one and had fun finding trims to match the "My Family" scraps. The Cub Scouts have an annual cake bake. These shots are from the November '07 event - Blake's first with that pack. I scraplifted another Allison Davis layout for these wrestling shots of Tom and the boys on Blake's birthday in '07. It was his 9th birthday. This weekend will be a special one for our family. After five years in Cub Scouts, Blake will be "crossing over" to Boy Scouts at the pack Pinewood Derby on Sunday. I'm nowhere near "caught up" with scrapping his Cub Scout photos, but I've been trying to get as many scrapped as possible before Sunday. I've pulled everything Cub Scout related and I'm going to put them in a K & Co. Cub Scout album to give him at his Crossover. He's worked really hard and made a big commitment to stick with Cub Scouts. Our goal is to help him and encourage him on his path to Eagle Scout someday. Lovin' all the inpsiration! 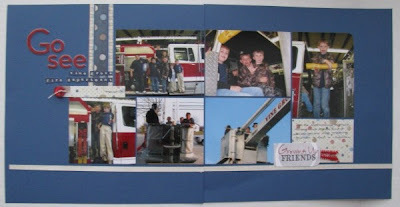 Scrapbook Trends is a great source, your lifts are all awesome! I love your layouts...I am so not getting into my scrapping lately. Can't wait for the "family" line to become available. Awesome lo's...love them and those papers! I always just love your 2-pagers! Thanks for inspiring me! !